Long Beach, Calif. – May 7, 2016 – Formula DRIFT presented by BlackVue returned to Atlanta for Round 2: Advance Auto Parts Road to the Championship sponsored by Gumout. Vaughn Gittin in the Monster Energy / Nitto Tire Ford Mustang RTR takes the victory to move into the lead in the Pro Championship standings. 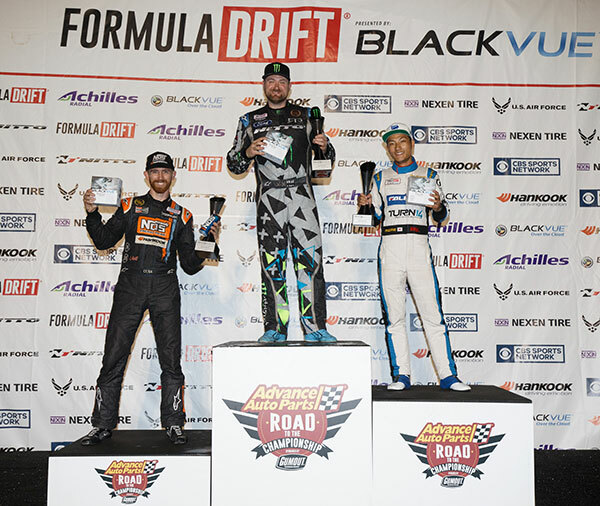 The Advance Auto Parts Road to the Championship sponsored by Gumout returned to the home of the inaugural Formula DRIFT event. The event weekend featured both the PRO 2 championship and Pro Championship with a full schedule of on-track action. The Pro Championship point standings were shaken up with the top three point leaders being knocked out in the Top 32 competition. 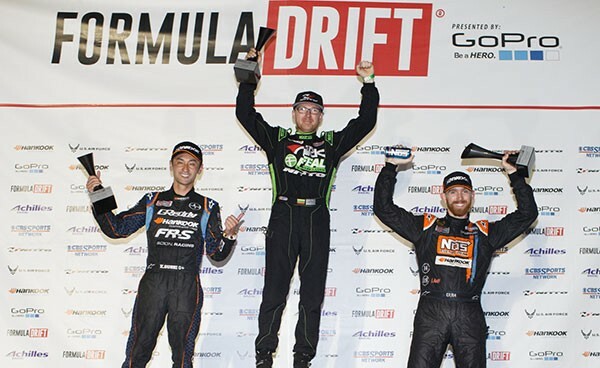 Experience proved to be a factor with the Top 4 including three past champions, who also have competed at every Formula DRIFT event at Road Atlanta since the beginning. Two-time champion, Chris Forsberg in the NOS Energy Drink / Hankook Nissan 370Z faced off against 2010 champion and the number one qualifier, Vaughn Gittin. Gittin outperformed his close friend, Forsberg, in a close battle to move into the Finals. 2011 champion, Dai Yoshihara in the Falken Tire / Turn 14 Subaru BRZ faced against the young gun, Alec Hohnadell in the Hohnadell / Enjuku / Get Nuts Lab Nissan S14. Yoshihara advanced to meet Gittin in the Finals. Gittin was no match for Yoshihara and completed the perfect weekend, earning both the top qualifying spot and the victory, while moving into the Pro Championship points lead. Yoshihara notably saw his first podium since 2013, while Forsberg finished in third place. Long Beach, Calif. – May 9, 2015 – Formula DRIFT presented by GoPro returned to Road Atlanta for Round 2: Road to the Championship. Aurimas “Odi” Bakchis in the Feal Suspension / ARK Performance / Nitto Tire Nissan 240 SX takes the victory for his first Formula DRIFT win of his career and rises to the top of the standings. Round 2: Road to the Championship was a night of upsets as the top qualifiers failed to move past the early rounds of the competition. The action packed event provided the fans with a competitive atmosphere that kept them on their feet throughout the night. 240,000 fans tuned in to watch the competition unfold on the Livestream broadcast during the event weekend. The 2015 Formula DRIFT season will continue to Round 3: Uncharted Territory on June 5-6 and for the first time be held at Orlando Speedworld. For more information visit: www.formuladrift.com and find Formula DRIFT on Instagram, Facebook and Twitter. Long Beach, Calif. – May 10, 2014 – Formula DRIFT presented by GoPro entered Road Atlanta for Round 2: Road to the Championship. Vaughn Gittin in the Monster Energy / Nitto Ford Mustang takes the victory moving him into second place in the championship standings. Round 2: Road to the Championship marked the eleventh visit to Road Atlanta. The thousands of fans in attendance witnessed an action packed event weekend. 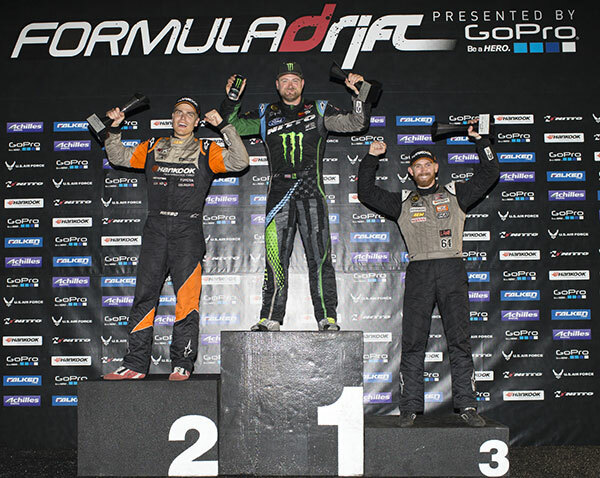 Vaughn Gittin fought his way to the top of the podium through tough competition to take his first victory of the season and move into second place in the point standings. Gittin matched up against Fredric Aasbo in the Hankook Tire Scion Racing tC in the finals. After a tightly fought battle Gittin was awarded the win. Chris Forsberg in the Hankook Tire Nissan 370Z rounded out the podium in third place to remain in first place in the championship. The 2014 Formula DRIFT season continues with Round 3 on May 30-31 at Homestead-Miami Speedway. For Mark Lenardon, the past few months have included everything from building cars, cross-country journey’s and computer issues. Without fail, he’s managed to put together an awesome 10 min long video showcasing highlights from the first 3 rounds of the 2011 championship season.